The Dutch have a long association with Malaysia having first encountered the Sultan of Johor in 1602 when their fleet was looking for spices to trade. 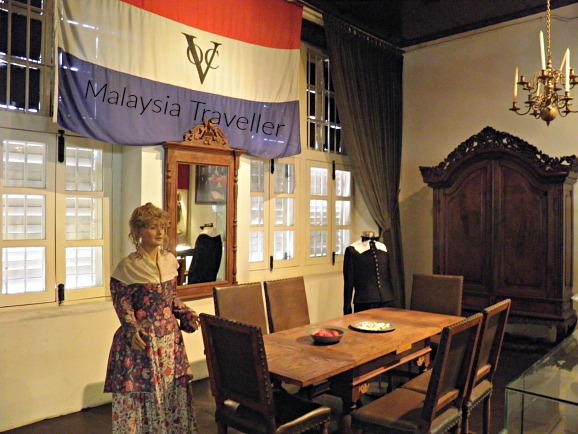 Holland colonised Melaka from 1641 until the British took over in 1826. The Dutch Graveyard contains the remains of some of the early settlers. One of the lesser visited relics of those times is the Dutch fort at Kuala Linggi. The remains of the red laterite stone walls still stand, marking the perimeter of the fort which overlooks the mouth of the River Linggi on the northern edge of Melaka state. The word 'Holland' in Malay is belanda. The Malay name for the red haired, long-nosed proboscis monkey is orang belanda (Dutch man) which is not very complimentary. What did the Malays call proboscis monkeys before the Dutch arrived I wonder? Similarly, the Malay name for guinea pig is tikus belanda (literally Dutch mouse) and soursop, the fruit of the Annona muricata tree is known in Malay as durian belanda. Perhaps both of these species were introduced into Malaya by the Dutch. There was a village in Perak called Blanda Mabok (Drunken Dutchman), named after a heavy drinker adventurer who used to live there. It is now renamed Ulu Sepetang. Apart from these oddities, what else did the Dutch leave behind from their 180 years on the Peninsula? Their influence can be seen in some of the architecture, particularly in Melaka. They also left behind a community of mixed race Dutch Asians, some of whose descendants still carry Dutch names. There must be a lot more. An area for me to research further.